﻿ Galatians 3:19 Why the Law then? It was added because of transgressions, having been ordained through angels by the agency of a mediator, until the seed would come to whom the promise had been made. Why the law then? 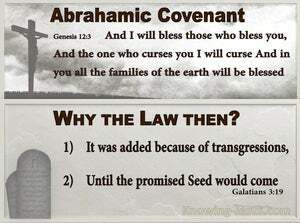 It was added because of transgressions until the Seed to whom the promise was made would come. [The law] was ordered through angels by means of a mediator. Why then the law? It was added on account of transgressions, until the seed would come to whom it was promised, which was arranged through heavenly agents in the hand of a mediator. What then is [the benefit of] the law of Moses? It was introduced [as part of God's revelation] in order to define what sin was, until the seed [i.e., Jesus] would come, to whom the promise [of never ending life] was made. The law of Moses was ordained through [the medium of] angels and [delivered] through the hand of an intermediary [i.e., Moses]. What, then, was the purpose of the law? It was added on account of transgressions, (till the offspring should come, to whom the promise was made,) having been appointed through the service of angels, in the hand of a mediator. What then is the law? It was an addition made because of sin, till the coming of the seed to whom the undertaking had been given; and it was ordered through angels by the hand of a go-between. "To what purpose then was the law?" it was added as a check to transgressors, till the offspring should come to whom the promise was made; and it was ordained by angels with the intervention of a mediator. Then what is the law? It was added on account of the transgressions, until the seed to whom the promise was made should come; being ordained by angels in the hand of a mediator. Wherefore then was the law? It was added because of transgressions, till the seed should come to whom the promise was made: and it was ordained by angels, in the hand of a mediator. What then the law? It was added on account of transgressions, (till the seed come to whom it was promised;) appointed by angels in the hand of a mediator. Why then the law? It was added on account of transgressions, until the descendant should come to whom it had been promised, having been ordered through angels by the hand of a mediator. Why then the Law? It was added because of transgressions, until the Seed should come to those to whom it had been promised, being ordained through angels in the Mediator's hand. Wherefore then serveth the law? 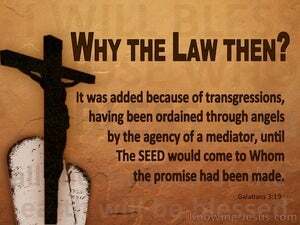 The law was added because of transgression - till the seed came, to which the promise was made - and it was ordained by angels in the hand of a mediator. To what purpose, then, was the Law? It was imposed later for the sake of transgressions, until the "Offspring" should come to whom the promise had been made. It was arranged through angels by the hand of a mediator. To what end then was the Law? It was added because of transgressions, till the offspring should come to whom the promise belongeth, having been ordained through angels by the hand of a mediator. What then? The law was added on account of transgressions, till the offspring should come to which the promise was made, being appointed by angels by the hand of a mediator. To what end then was the law given? It was given on account of transgressions, until that seed should come to whom the promise was made, being delivered through the ministry of angels into the hand of a mediator. What, then, you ask, was the use of the Law? It was a later addition, to make men conscious of their wrong-doings, and intended to last only till the coming of that 'offspring' to whom the promise had been made; and it was delivered through angels by a mediator. Then what about the law? It was added later on to increase transgressions, until the descendant to whom the promise was made should come, enacted through the agency of angels in the person of an intermediary. What, then, is the law? It was added because of the transgressions, until the Seed should come to Whom it had been promised; having been arranged through angels in the hand of a mediator. What then availeth the law? It was added because of transgressions, till the seed should come, to whom the promise was made; and it was delivered by angels in the hand of a mediator. 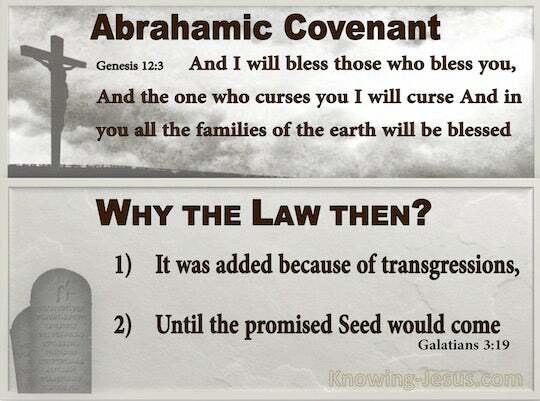 18 For if the inheritance is based on law, it is no longer based on a promise; but God has granted it to Abraham by means of a promise. 19 Why the Law then? It was added because of transgressions, having been ordained through angels by the agency of a mediator, until the seed would come to whom the promise had been made. 20 Now a mediator is not for one party only; whereas God is only one. you who received the law as ordained by angels, and yet did not keep it." "Or what great nation is there that has statutes and judgments as righteous as this whole law which I am setting before you today? "These words the LORD spoke to all your assembly at the mountain from the midst of the fire, of the cloud and of the thick gloom, with a great voice, and He added no more. He wrote them on two tablets of stone and gave them to me. "The LORD spoke further to me, saying, 'I have seen this people, and indeed, it is a stubborn people.